I have several forms on different websites that are not appearing. Sometimes they appear very faint in the background and sometimes they don't appear at all. I have submitted this issue once before and you told me it was a slow internet connection. However that is not the case. I have tested this on several different internet connections with incredible speeds. Please tell me what is wrong and why this is happening. I have paid for your forms that are not working. I am losing money when a form does not appear on my site. Have tested in mulitple browsers all with the same issue. First off, I apologize for any inconvenience this have caused you. I understand where you're coming from. I can definitely see what you are talking about. Somtimes the form loads but most of the time it doesn't. 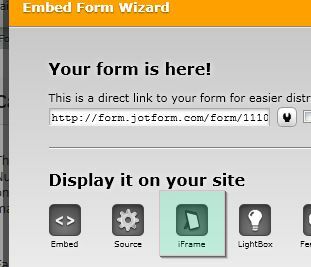 A solution that quickly comes to mind is to embed your forms using iframe embed code. Let me know how this works out for you. I'll await your response.